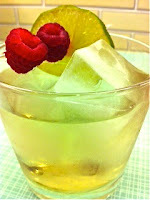 Not overly sweet and very low calorie (about 100), this warm-weather drink is refreshing and extremely easy to make. All you have to do is open the bottles and pour over ice. No shaking, muddling, or straining needed. Sounds like a good summer activity to me. You?